Although not all, the majority of my research has involved combining advancements in analysis and hardware to develop methods and tools for fluorescence microscopy. Some research examples are provided here. A phasor plot of a bulk fluorescein sample. When fluorophores are excited they emit a photon after a delay with an exponential probability distribution. These delays are often analyzed by fitting to one or more exponentials, but this approach is challenging in the presence of complicated backgrounds or in the low-count limit. Phasor analysis is an alternate approach to analyzing lifetimes which uses a Fourier analysis of photon arrival times to determine lifetimes or evaluate combinations of lifetime components. It provides several powerful advantages such as being very fast to compute, and yielding results with meaningful interpretations even in complicated environments. I'm interested in the use of phasor analysis for examining the behaviors of single molecules at fast timescales where few counts are available, and also in the use of phasor analysis for imaging. The Digital Frequency Domain algorithm. Digital Frequency Domain (DFD) lifetime acquisition uses techniques derived from analog frequency domain approaches, but applied in a digital way. By doing this, DFD achieves a precision for phasor analysis which is equivalent to the best TCSPC systems. Rather than precisely identifying the arrival time of each photon, the actual goal of lifetime acquisition is to precisely identify the fluorescence lifetimes from a distribution of photons. Following this principle, the DFD approach resolves each photon to within a digital sampling window, and uses heterodyning to ensure even sampling of the lifetime response. It was shown that this approach yields a phasor precision equivalent to TCSPC, but without dead times, and with inexpensive components which allow lifetime measurements in many independent channels. For details, see Microsc Res Tech 71(3): 201-213, 2008 (Preprint). the dynamic FRET behavior observed with calmodulin. 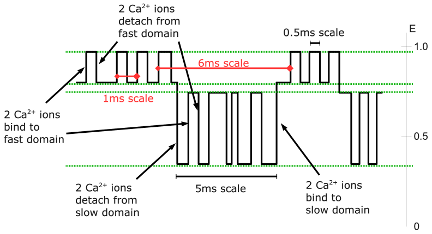 Phasor Trajectory Analysis (PTA) is a lifetime analysis technique which allows the tracking of lifetime changes with very few photons (about 20), which makes it quite suitable for single-molecule studies. Since only 20 photons are required, even under single-molecule conditions PTA permits the direct observation of fast millisecond dynamics. By using the vector properties of phasors, PTA can combine both donor and acceptor channel lifetime information into a single measurement of Förster Resonance Energy Transfer (FRET) efficiency which is robust across the entire range of FRET values. Many proteins function by undergoing a conformational change in response to a binding interaction. PTA can be used with FRET to directly observe fast conformational dynamics in proteins, and as a result, can be a powerful tool for exploring signaling and regulatory processes. For details, see chapters 3 and 4 of my thesis. Since single-molecule measurements are performed at low concentrations, it can take a long time to accumulate adequate statistics to examine a population. Increasing acquisition throughput by parallelization makes it possible to obtain the detailed information of a single-molecule measurement but with significantly reduced measurement time. This permits screening of large numbers of samples, and also makes it possible to observe faster timescale changes to a population. Ordinarily optical microscopy is constrained to resolving particles which are at least 200–300nm apart. Recently, a series of techniques have been developed which exceed this resolution limit by selectively switching the fluorescence of probes on and off. We developed a new approach to superresolution called SOFI which operates by a cumulant analysis of the stochastic blinking of fluorophores. This approach has several advantages, the most important being it does not require regulating the timing of when fluorophores are turned on or off. This allows the technique to operate on conventional fluorescence microscopes without any hardware modification, and also permits the technique to work with quantum dots, which are extremely bright and have good photostability. I also have an interest in fundamental questions relating to the development of verifiably secure software. The vast majority of security holes which exist are ones which could be systematically avoided through different design decisions for languages, libraries, or software architectures. Most other issues can be mitigated by systematic engineering approaches to component testing. I have also been interested in the methods of specifying complicated geometries suitable for 3D printing. Several examples of my work in this area are available here. Among my interests in this area are the methods of parametric design connecting externally useful values directly to a complex rendering, and the specification of useful shapes by mathematical surface definition.